It was 5 pm on a Thursday evening when I received a call from the Concierge of a Hotel in Downtown Cabo San Lucas, telling me he had a wedding express request for the very next day! I was totally surprised and to be honest, a little overwhelmed when I began to digest the idea of planning a wedding with less than 24 hours notice! Such an important event requires so much dedication and love that I wasn’t at all sure. However, after a few minutes of thinking and processing the request I accepted!. Thinking that I might be crazy, I couldn’t give up such an opportunity, what an unexpected request, but then again, they say love comes in unexpected ways so “no” was never an option. When I spoke with the Bride, she explained she wanted a Vow Renewal Ceremony to celebrate their 15th Wedding Anniversary. Only 7 guests would attend and they wanted a beach ceremony, a yellow and orange flower bouquet, a minister for a symbolic ceremony and a cake. A fabulous yet intimate ceremony. I began calling our preferred suppliers right away and thought long and hard (not too long) of where to hold this magical event. 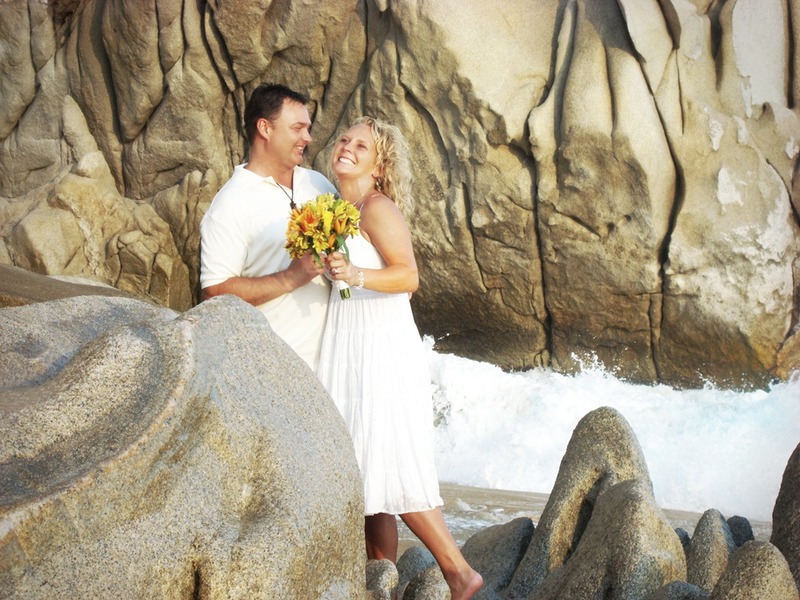 Lovers beach, right next to the Arch with the perfect view of the Cabo San Lucas bay and a barefoot couple came to mind. The perfect place to renew vows and create long lasting new ones! The couple agreed and this last minute event began to take shape. The next day (wedding day!) 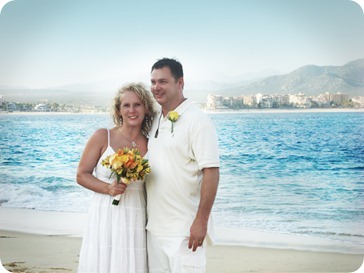 we all met at the Cabo San Lucas marina at 5pm, lighting was perfect! We went on board a small boat that took the bridal party, the minister and I to “Land´s End”. Our captain took us on a little tour of the famous “Arch” and to the sea lion colony, to see (and smell) these great animals in there natural environment. Everyone had a chance to take great pictures and after a little while, we headed over to Lover´s Beach. First thing we did was take off our shoes and jump onto the super soft sand. At that time of day, there were very few people, so we were going to basically have this great, romantic spot all to ourselves. 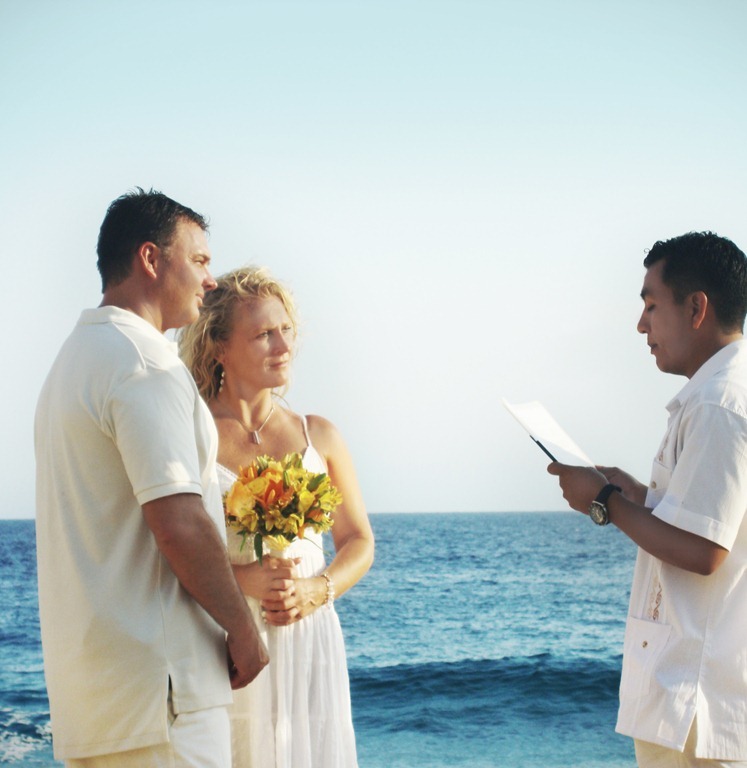 We walked on the beige colored sand over to the Pacific Ocean side and the ceremony began. Guests and myself witnessed a truly magical ceremony; vows were exchanged in an almost perfect setting. A truly memorable evening, with the oceans waves crashing in the backround and a wonderfully warming sunset. On the way back to the marina, our captain took us for a brief tour of Medano Beach, the lively beach zone in Cabo San Lucas, which is filled with casual restaurants and bars, where we could hear and see the liveliness and just how much fun this area is. It was clearly going to be a busy night. When we were back at the marina, I felt like if we had gone to a remote place, where only the bride, groom and a few of us had witnessed a special moment.